This has been a long time coming. Ever since I saw the first 40k RPG, Dark Heresy, I had always wanted to RPG as an Astartes. Eventually, Deathwatch came out and fulfilled my dreams. It’s taken me a long time to finally break down and buy the Core Rule book. I’ve never had any experience with a tabletop RPG. The closet thing I came to was a single game session of Mutants and Masterminds. I also never really had a gaming group large enough to play a game. Then finally, I’ve never been a GM, and didn’t know if I wanted to play or GM. Well, my gaming circle has expanded enough to finally take up the game, and after reading the rulebook; I wonder what made me nervous. The core mechanics are a snap, and somewhat like the core mechanics of the standard 40k game. You move X distant, you shoot using your Ballistic Skill, and then you see if you wound (how much damage you do). Again, for someone who has no previous tabletop RPG experience, this is a nice easy mechanic to pick up. The skills are treated the same way. All the skills correspond to one of the base characteristics like Ballistic Skill or Fellowship, and a player just has to roll equal to or below to pass. 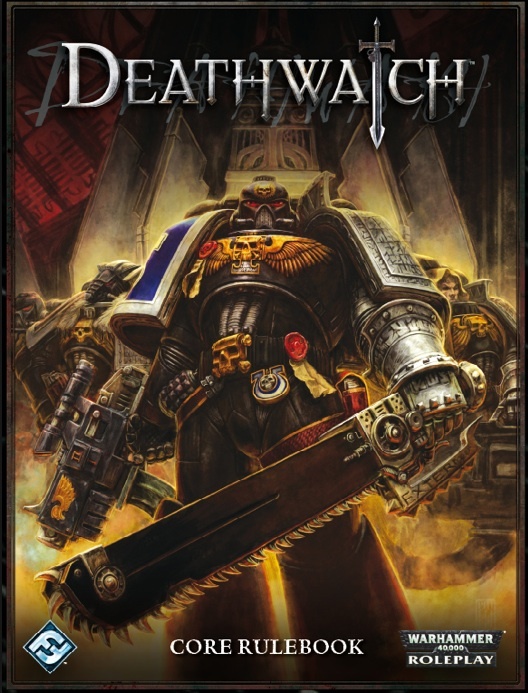 So, with a group of five players and me as a GM, my group will begin playing they’re first campaign of Deathwatch some time next weekend or the following. During that time, I’ll be posting character backgrounds and sheets along with a “campaign log” (basically the story with me acting as the narrator) with awards/honors and experience points at the end of each mission. I hope you come back and follow “The Liberation of Avalos”. As always, feel free to leave questions of tips on the forum on here in the comments.